The first thing that struck me when Tony led me down the Milton beat track last November, was the enchanting little wooden hut perched nobly above Craigo Stream. Stepping inside, I felt keenly that I was entering a sanctuary of memories and experiences. Over the mesmeric rush of the pool below, I could almost hear the whispered remnants of the conversations left by anglers past. Immediately, I sensed that here was a place which was loved and appreciated, not just by Tony, Alison and their family, but by many anglers from many places. The second thing that struck me was an almost overwhelming desire to be wading down the gravel shelf at Red Brae with my Bruce and Walker. Since that day and the months following it, when I spent most of my days off-shift travelling to and working at Finavon, Tony and I have come a long way. I knew that I wanted to be involved with Finavon in a big way, and that desire grew just a little bit more every time that I came and went. So it didn’t take very long for Heather and me to start thinking about moving our life slightly North East…and here we are. One of the first tasks which I undertook at FCW, back in those cold winter days was to harvest, trim and gather sheaves of willow canes. Anyone who fished at Finavon in the first month of the season, may remember seeing buckets full of them sitting outside every hut. I planted these in many of the soft edges up and down all four of the beats with the intention that the roots would take hold and help shore the banks up. Willow is fantastic stuff to plant, as you simply need to stick a cane into the ground where it will remain moist, and usually it will just grow. We seem to have had quite a successful take from the little wands, and once they grow bigger it will become necessary to keep them trimmed back so that they do their job without encroaching on casting space; which is always an issue with willow because it grows so quickly. Beeches on Castle Beat, where Iain has done much of his work. Since then, I’ve spent a lot of time planting other things too, Oak trees next to the Boat Pool, Honeysuckle around three of the huts, bird cherry scattered widely and Birches in a forest clearing adjacent to Harry’s Bar on Bogardo beat. There have been many days spent chopping and trimming my way down the edges of various pools to open them up for easier fishing. It’s particularly satisfying to get to the bottom of a pool, look back upstream and see the difference that you’ve made. 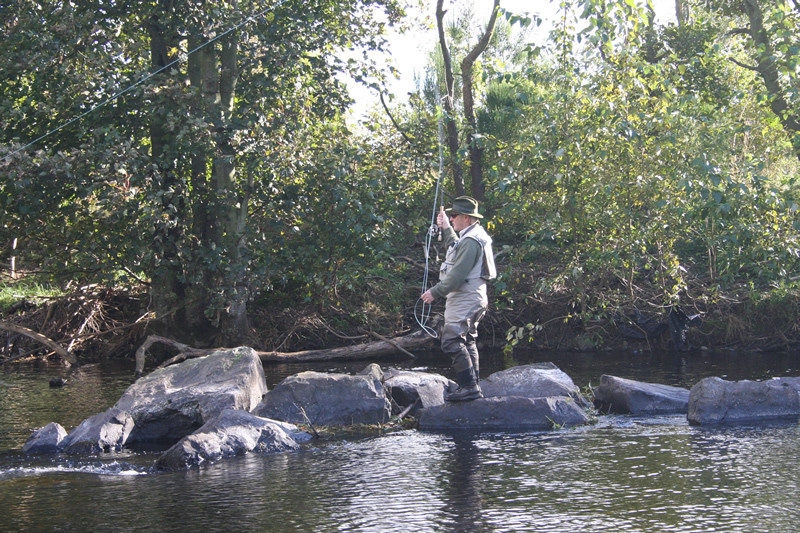 Beeches had this treatment at the beginning of the week and will now be much easier to fish effectively as the foliage on the North bank was really starting to impede when trying to form the loop of your roll cast. 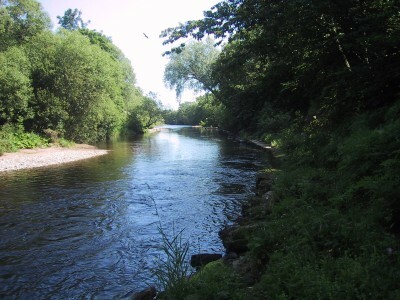 It is also possible to fish down the pool much more quietly now as you can wade it at ankle depth rather than knee depth, and stealth of course is of crucial importance when fishing for night time sea trout. For the past couple of months the most important job has been dealing with the infestation of Giant Hogweed at FCW. This nasty plant from Asia was another ill-conceived introduction by the Victorians, who have a lot to answer for considering the proliferation of species such as Himalayan Balsam and Rhododendron as well. The attack on the Hogweed has been simple and brutal, carried out mostly by spraying the leaves directly with our new specially sanctioned herbicide which is completely non-toxic to mammalian or piscine life. One of the problems however has been that some of the seed heads were 10-12 feet high and probably 10 inches in diameter, so spraying the leaves wasn’t really an option. These sinister looking monsters have been hacked down with saws and billhooks and the herbicide has been sprayed directly down the hollow stems and into the root system. We’re hoping that this will utterly destroy the rhizomes. I’ve been ending the day looking like a cross between a Pictish warrior of Finavon Hill and an Astronaut, thanks to the mixture of the blue dye from the spray, and the waders, overalls, gauntlets and safety goggles that I’ve been wearing! It has been a very hard and tiring task, but a very necessary one. It crossed my mind when stumbling and crawling with the heavy spray pack through the thickest of the dense cover that here was just a tiny flavour of what carrying a flame-thrower through the jungles of the Solomon Islands might have felt like! The spraying is still ongoing, but I’m confident that the worst of it is done. So if you happen to see any healthy looking thickets of Hogweed at Finavon, please do let Tony or myself know! The late Peter Ward fishing the head of Indies Pool from the South side. I’ve enjoyed meeting a lot of new and interesting people over the past eight months, and hopefully sown the seeds of some friendships too. I’ve been touched by the number of people asking for my input and advice, and I’ve been delighted to help out to the best of my ability. It has been a source of immense joy to me that some of this advice has even paid off with a fish for the odd angler. I’m always delighted to come and meet you when you’re fishing and try my best to help with any questions or needs you might have, so don’t hesitate to give me a shout when you come to FCW. 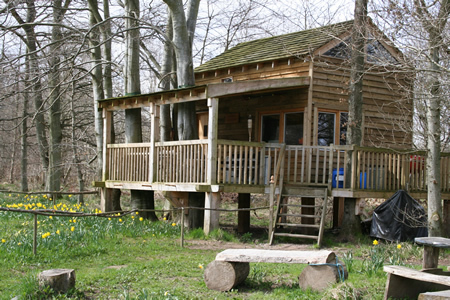 David’s Treehouse (DTH) at daffodil time. Finavon is a magical and evocative place. You can’t help but think about the ancient Picts who must surely have fished those very same pools for the Salmon they so revered. And what history has been trodden upon those riverbanks? Did Pictish war bands follow the river on their way to the great battle of Dunnichen? Did Roman legionaries stop by the river to wash, drink and even fish on their way North? Finavon is more than just a place to come and fish for Salmon, it is utterly enchanting and I, like many others have fallen in love with it. February the sixteenth this year was a Sunday, so no-one fished on that day. On Monday Moray caught a well conditioned kelt in Haughs Pool (immediately below the old pipe bridge) and on Thursday Ian Mac Master caught a thin but well restored grilse kelt in the Flats (Milton Beat). No frersh salmon have been seen yet. 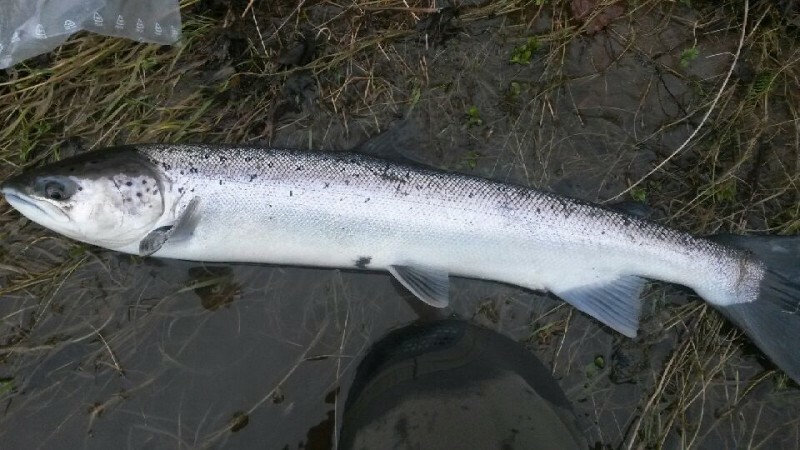 A well-mended but very thin grilse kelt caught and returned to the river in Flats on Milton Beat. The ‘belt-like’ profile, distended vent, oversized head and hard bright silver colour are characteristics of spent salmon (kelts) easily seen in this photo by Ian MacMaster. Closer inspection would most likely reveal the presence of gill maggots. It is good to see the fins of this fish in such good condition. 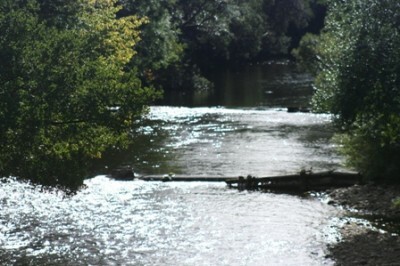 Unfortunately, very few of the South Esk’s salmon kelts live to return to the river to spawn again. Those that do (a lot less than 10%) are nearly all female. The South Esk is in excellent ply, with clean gravels and manageable levels of repair to banks needed after a series of moderate spates – nothing approaching the disastrous floods of further south. I feel we have escaped lightly. Some of the rubbish collected by the Scottish Oak Team last week from FCW riverbanks and woods after the winter floods. This was the result of a one-day clear up. One of the issues for anyone managing a river beat is that people throw their rubbish into the river – including on one memorable occasion a full-size blow-up Japanese (female) doll – which can ruin the feeling of wild natural environment that a river should have in its riparian setting. We spend a lot of time removing the junk and detritus of our ‘civilisation’. The situation with the Usan nets, as I mentioned in an earlier blog, now needs resolving – at the very least to sort out the issue of nets killing fish during slap periods and the close season. We should not allow a situation where the law is being ignored (or worse) to damage the South Esk’s wild salmon and sea trout stocks. At present it most certainly is. There may now be signs of official movement, with a legal process starting, a national review of freshwater angling management, another assessment of the value of Scottish freshwater angling to the economy and an ongoing focus on the South Esk by Marine Scotland and SEPA. In the background, but most importantly, the River’s SAC status makes it a priority in terms of the two qualifying species – Atlantic salmon and the freshwater mussel. You would have thought that all this research and other activity might have resulted in more targeted conservation action. Not yet I’m afraid. Before: Indies Hut with its flat roof. We decided to make it look less like a container and more like a proper hut, so we painted the flat, rusting and potentially leaky roof with a gooey bitumen paint after cleaning it up a bit. Then we erected a light-construction roof with hand-cut larch shingles. The result is below, and I think adds a bit of rusticity yto the hut, as opposed to the ambience of a badly camouflaged container port. 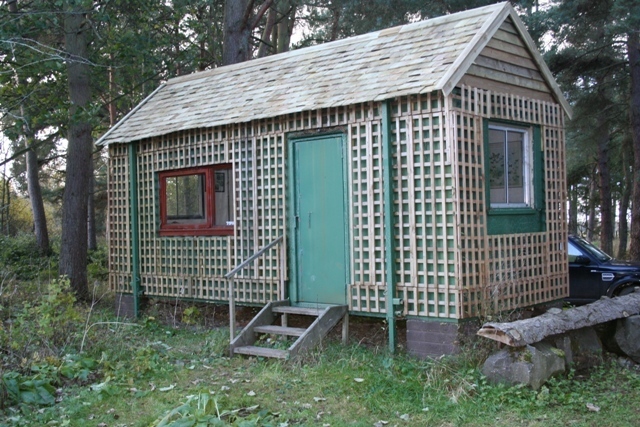 After: Indies Hut with its new shingles-clad & pitched roof. When eventually the honeysuckle grows up the trellis surrounds I am hoping you would never know that underneath all the camouflage lies a bog-standard ship’s container! Winter work is all about maintenance and improvements. The modern angler expects to have shelter – a place to get out of the rain and wind, or a place to snooze during a night’s sea trout fishing. It is no longer acceptable for people to pay rents and find themselves fishing out of the boot of their car! Finavon Castle Water prides itself on the whole experience, of which fishing for salmon and sea trout is the most important part. So, we sell the experience of being in a beautiful place with simple, modern facilities and the chance of a fish. We do not sell fish by numbers, although there are occasions when the South Esk can be generous! 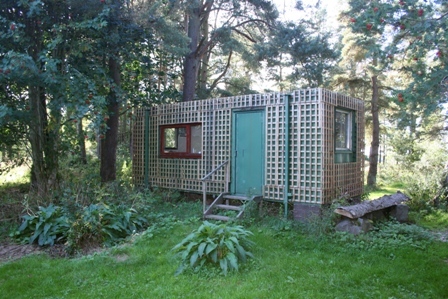 The 4 huts at FCW, one on each of the 4 beats, are sited to give our visitors a special view of the river. Vehicle access and parking is adjacent to the huts and the location of each is private and exclusive. Actually, the setting of all 4 huts can be rather romantic, depending of course on what your inclinations and stage of life may be!